Ogun State has both geographical and logistics advantages that enable it the opportunity to become a true agricultural powerhouse in the West Africa region. 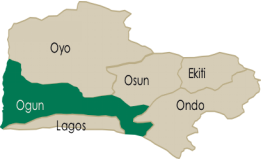 Ogun State shares borders with Oyo, Osun, Ondo and Lagos States (the commercial capital of Nigeria), in addition to Benin Republic. This has strategic positioning gives Ogun State the competitive advantage for logistics and export as a gateway to Lagos, the rest of Nigeria and West African sub-region. The international airport and busy port of Lagos are about 80km to Abeokuta, the capital of Ogun State. Ogun State has high average daily temperatures throughout the year. Coupled with the State’s high levels of rainfall it makes for a good, accommodating conditions for agriculture. Adequate water bodies to provide all-year round irrigation. 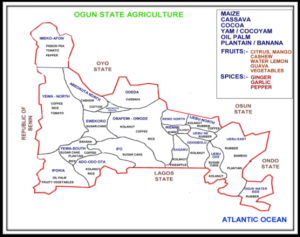 Ogun State’s 1.2 Million ha of arable land or spread across a diverse agricultural landscape, allowing for a wide variety of potential food and cash crops. Access to land/security:Ogun State has developed simple and fast land allocation system and ensures security of investors. Land Clearing and Mechanization:Availability of land clearing, preparation and mechanization equipment (bulldozers and tractors with implements). Inputs availability and delivery:Easy access to agricultural inputs through Agro-Services Corporation and other private Agro-dealers in the State. Provision of Extension Services:Training of Farmers and dissemination of information on best agricultural practices by Extension Agents in the State. Access to finance:Information on loans available to Farmers through various financing schemes. Infrastructure:Rural infrastructure such as roads, irrigation system and storage facilities that support agricultural production and industrialization. Data gathering and information dissemination:Up-to-date agricultural data and statistics through various agents of Government. The State’s agricultural potential is rich, due to its comparative advantage in cash and food crops, poultry and fisheries. Considering the population of Ogun State, the enormous supply deficit of Agro-Allied Industries and the opportunities (gaps) in the different value chains, the market potential runs to hundreds of millions of Naira. · Provision of efficient transportation system for timely evacuation of produce so as to curb post-harvest losses.